To erode that solidarity, some billionaire hedge fund owners and multinational CEOs work to divide workers. 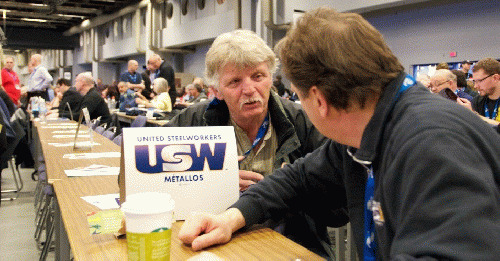 The union I lead, the United Steelworkers (USW), believes in unity, that "all working men and women, regardless of creed, color or nationality" are eligible for membership. I return to that statement in times like these, times when terrorists shoot up mosques in Christchurch, New Zealand, killing 50 worshipers; a synagogue in the USW's hometown of Pittsburgh, killing 11; an African Methodist Episcopal Church in Charleston, South Carolina, killing nine; a Sikh temple near Milwaukee, killing six; a nightclub in Orlando, killing 49, mostly young gay people. The USW membership eligibility statement is an assertion of inclusion. All working men and women qualify. They can all join. They can all attend local union meetings at which members call each other "brother" and "sister." This practice creates artificial, but crucial, bonds between them. This solidarity gives the group strength when facing off against massive multinational corporations and demanding decent pay and dignified working conditions. To erode that solidarity, some billionaire hedge fund owners and multinational CEOs work to divide workers. These wealthy .01 percenters separate people by cultivating hate. Some are the same billionaire sugar daddies of alt-right hate sites like Breitbart and more conventional hate media outlets like Fox News. Investigative journalist Jane Mayer wrote a book about their efforts titled "Dark Money: The Hidden History of the Billionaires Behind the Rise of the Radical Right." This hate-mongering sets workaday people against each other. That weakens them politically. And it contributes to false-fear-provoked violence. Look, the labor movement is far from perfect. A couple of decades ago, African-American USW members had to sue steel corporations and the union to secure equal opportunity. Clearly, we haven't always lived up to our principles. But the goal of brotherhood and sisterhood among all workers is a noble one that must be strived for. We all sweat together to support ourselves and our families. We all come to each other's aid when a fellow worker's home burns down or child falls ill. We stand shoulder to shoulder to demand a just portion of the profits created by our labor. Exclusion is self-defeating, whether workers belong to a labor union or not. Because every man and woman is needed on deck, we can't let billionaire hate purveyors like the Mercers and Murdochs split us, in our workplaces or in our communities. "In April of 2016, the SPLC documented Breitbart's embrace of extremist ideas and racist tropes such as black-on-white crime and anti-Muslim conspiracy theories. Further analyses showed how under executive chair Stephen Bannon, Breitbart's comment section became a safe space for anti-Semitic language." Bannon specifically told Mother Jones magazine that Breitbart was the platform for the alt-right, which has lifted anti-Semitic and white supremacist voices. At the same time, the Mercers, Robert and his daughter Rebekah, were giving millions to right-wing anti-union groups through the Mercer Family Foundation. These include the virulent anti-union Heartland Institute ($6.68 million), Heritage Foundation ($2 million), CATO Institute ($1.2 million) and Manhattan Institute for Policy Research($2.18 million).